Studio Daan Roosegaarde wants you to help fight air pollution and smog– by wearing it on your finger. With his proposed air-purifier called the Smog Free Tower, Roosegaarde is bringing the reality of smog to his Kickstarter supporters’ fingertips. Those pledging $271 or more to fund the air cleaning project with receive a unique piece of jewelry, a ring made from actual compressed smog particles. Originally used indoors in hospitals, the Smog Free Tower idea has expanded to encompass a public space, with a project called Smog Free Park. Inside the device’s area, the tower creates a large bubble of clean, smog-free air for visitors to enjoy. In order to remind people about the pollutants that the tower removes, Roosegaarde decided to create a sort of souvenir sustainability at work. 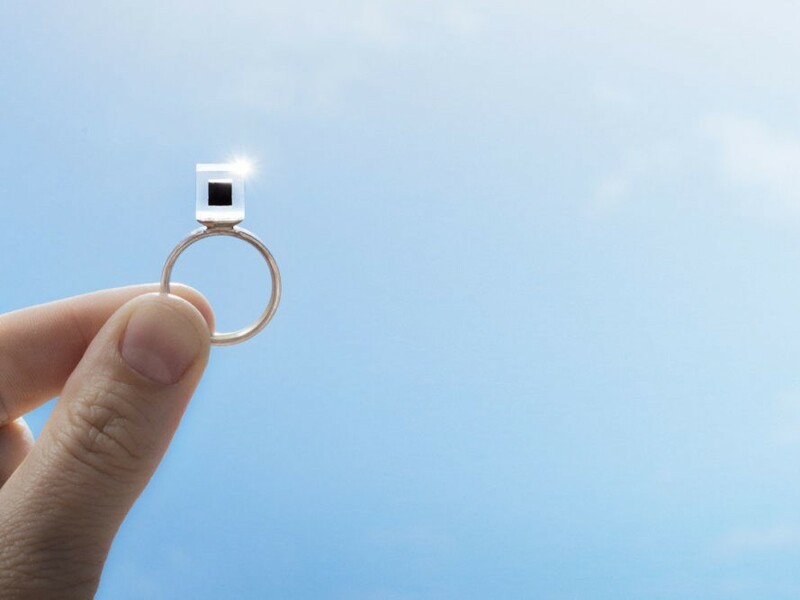 Since smog contains particles of carbon, Roosegaarde decided to compress elements of the pollution, to create truly unique high end jewelry. The smog particles are compressed into translucent cubes, which are used to adorn rings and cufflinks. Each Smog Free gem is made up of 1000 cubic meters of polluted area, transforming a health hazard into an element of beauty. Wearers of the Smog Free Rings and Smog Free Cufflinks carry both a reminder and a message of the importance of protecting the environment. The unique and noticeable design is a catalyst to spark up conversation about pollution. Roosegaarde plans to install the first Smog Free Park in Rotterdam in September 2015. Supporters can still snag their own Smog Free jewelry through the Kickstarter campaign. Studio Daan Roosegaarde wants you to help fight air pollution and smog- by wearing it on your finger. With his proposed air-purifier called the Smog Free Tower, Roosegaarde is bringing the reality of smog to his Kickstarter supporters� fingertips. Those pledging $271 or more to fund the air cleaning project with receive a unique piece of jewelry, a ring made from actual compressed smog particles.